RALPH. D. DOUGHTY. - HIS FINAL DAYS. HONOURING THE LIFE OF RALPH. D. DOUGHTY. 26th April 1915 Saw to the slinging of horses and got aboard the punt, and was towed ashore by a mine-sweeper. Within a mile from the shore we became a mark for the enemy's snipers and they served it up pretty hot, one bullet went through Doc's haversack, while another introduced itself to Sgt Gurd and myself as we were sitting together. Missed Gurd's head by a matter of decimals of an inch. Passed close to 'London' as she let go a broadside. Knocked one chap's cap off. On getting to the shore, rec. orders to go back as the landing was too crowded. 5th October 1915 Arrived at destination (Shrapnel Gully) some unearthly hour this morning. This place doesn't belie its name either. Had a good view of the guns shelling one of our batteries perched away up on a ridge to our left. Awaiting orders to go into action. No water in this place Get issued with a gallon a day which is to do you for washing, drinking & messing generals. Don't want to spit much. Some talk of being relieved & going away to Lemnos for a spell. Some of our chaps (what's left of them) don't half want it either. Out of 98 men to land 76 are casualties. 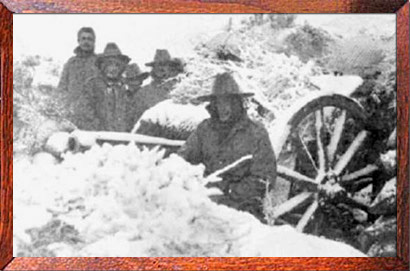 29th November 1915 Stopped snowing, but absolutely raw. Tired of being an Eskimo so crawled out into it. From 10 till 2 the Turks have been bombarding out trenches positions, one shell, a 5.9 HE has just lobbed into Shaw's dug out just above me, but didn't explode. He is only bruised. Johnston wounded with shrapnel. Sorry to report that Lt Dixon (Jim) badly wounded. The heaviest bombardment the Turks have given us for months. Sent over 8.2 HE Howitzers. Smashed Lone Pine about. Casualties very heavy on our side. Expecting an attack tonight. 14th April 1916 Travelling all night and still at it. Pulled up at Auzáville-en-Argonne at 7.30. Watered and fed the horses. Struck 2 carriages of Australian nurses on a side line, who are going to work near the firing line. We are now in the War Zone. Every cottage along the line is a billet for troops. Everywhere are French soldiers, a great number of them working in the fields with the crops. Arrived at our destination Borre and packed 8 mules along a road knee deep in mud. Left the station at 8 pm and got out to our billet at 10.30. We are quartered in a French farmhouse, from which the sound of the guns are quite audible, and all night long the sky is brightened by their flashes. 2nd September 1916 Decent day today. Went to 27th Bty A W.L. and handed over 4 guns. Rode into Poperinge later on. Got back to W.L. at 6 pm. Orders to hand to take my section into action tonight. Rode up to rendezvous and "embarked" on a G.S Waggon and was driven up to the Position. On the way we came through Ypres. Saw what's left of the Cloth Hall and Cathedral. Both looking very pretty after their sundry bombardments. Ypres is blown to blazes generally. Must have been quite a decent city once upon a time. Our guide lost himself completely so had to engineer my way out by map. Got within half a mile of the Battery when we got a gas alarm signalled, but it missed us. Damn these Stun machine guns. LIEUTENANT R.D.DOUGHTY. MC - HIS FINAL DAYS.